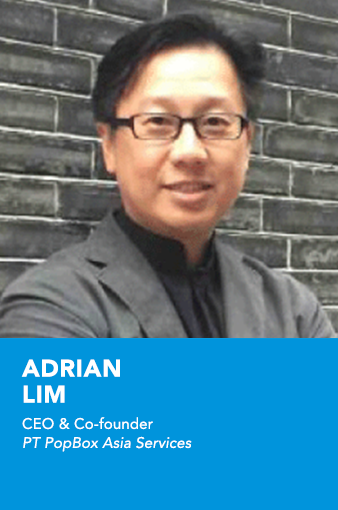 Adrian Lim is co-founder and CEO of PT PopBox Asia Services, a specialized automated parcels solution provider. PopBox Asia provides automated parcel lockers touch point that serve the local e-commerce and courier companies. Mr. Lim also holds a position as the President Director of Innovation Factory, the entity behind BLOCK71 Indonesia and SKALA startup accelerator, that aims to build the Indonesian startup ecosystem and develop local talents. Prior to founding PopBox, Mr. Lim has worked as a Consultant in Singapore, Malaysia, Dubai & China over a span of 14 years. Mr. Lim experienced firsthand the growth of e-Commerce and the emergence of O2O solutions during his time in China, which draws him towards the vast potential of e-Commerce logistics and developing solutions suited for South East Asia. Mr. Lim graduated from the University of Michigan with a Master Degree in Mechanical Engineering. Prior to the USA, he obtained his BSc (Hons) in Mechanical Engineering from Imperial College of London, UK.